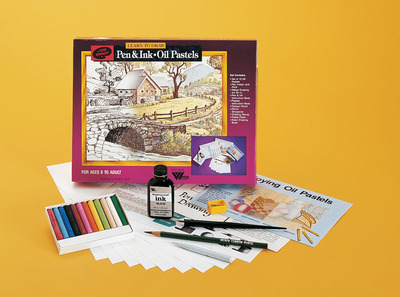 Quality art materials and instructions combine to teach these media in another of Gnagy's "Learn to Draw" series. Value packed and especially written for new artists ages 8 to adult. Non-toxic. The set includes 12 oil pastels, drawing ink (29 ml), pen holder and point, art pencil and sharpener, blending stump, drawing paper, "Pen & Ink, Oil Pastels", and Basic Drawing Booklets.